Jim Paluch addresses attendees at the Face to Face event at Schill Grounds Management in September. One year. Five companies. Hundreds of takeaways. With the 2014 Face to Face series drawn to a close, JP Horizons President Jim Paluch pulled together Smart Company participants for a teleconference Dec. 12 to boil down some of their top observations throughout the year. Smart Companies are the sponsors of the events. 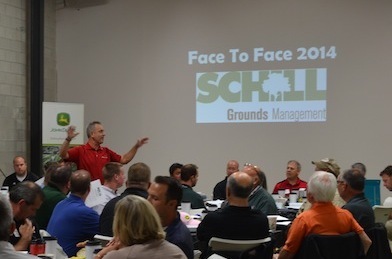 The notion for Face to Face is for landscape business owners to understand they can always get better, said Paluch, who heads the series. Attendees get an inside look at a firm’s sales, operations and accounting division, among other areas and issues, to then brainstorm and offer suggestions for improvement. Signature Landscape, Kansas City, Kan. Among this year’s Smart Companies were LS Training System, Douglas Dynamics, Snow & Ice Management Association, Nature Safe, Include Software and John Deere. Mark Adamson, senior VP of sales and marketing at Douglas Dynamics, identified the seasonal transition from “green to white,” or landscaping to snow removal, as a big talking point in 2014. It’s good to “test out the plows before the first flake of snow is predicted,” he offered. As a manufacturer, he said he’s looking into ways to ease and quicken that transition. “Snow preparedness meetings are something that cannot be taken lightly,” Paluch added. Arden Urbano, VP of LS Training System, weighed in on preparedness in terms of training crews. Always make changes and push the envelope to move forward, Seven said. Do that by keeping “essentialism” top of mind. Focus on the most essential things in your business to take you to the next level. Lastly, Nature Safe Brand Manager Rick Geise emphasized the need to set aside time to better operations. “Time is a precious commodity for everybody,” Geise said. Use yours to work on the business instead of in it. To that end, Paluch challenged contractors to make it a New Year’s resolution to continue building relationships within the industry—and doing it face to face.